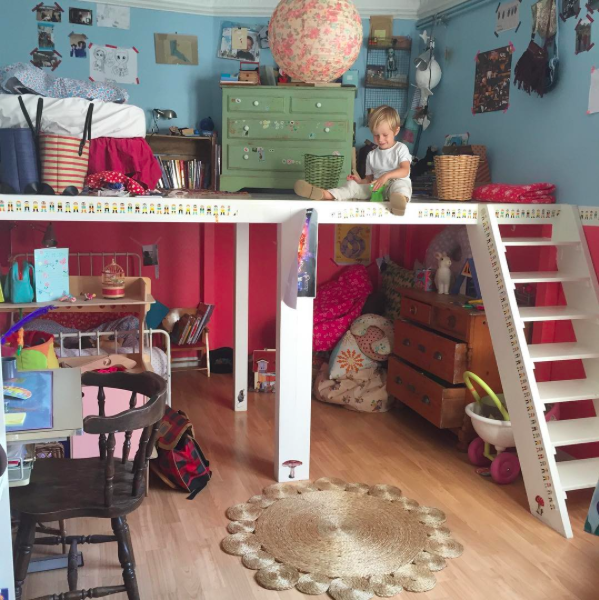 I wanted to share with you some pictures of my daughters’ room, as it is sadly very likely going to have to change. The girls are starting to get too tall to fit into their space. You see, the girls have always shared a room, as do a lot of children in Paris. Our flats are relatively small over here and every extra meter is a luxury. The girls have always quite liked sharing, but also both needed space for themselves. As we were not going to move anytime soon, I decided to divide the room horizontally rather than vertically. That way I created a few of the precious extra square meters. It has been a great success. The girls can talk and play together, but they can also take themselves away when they want to. My inspiration was actually a doll house! 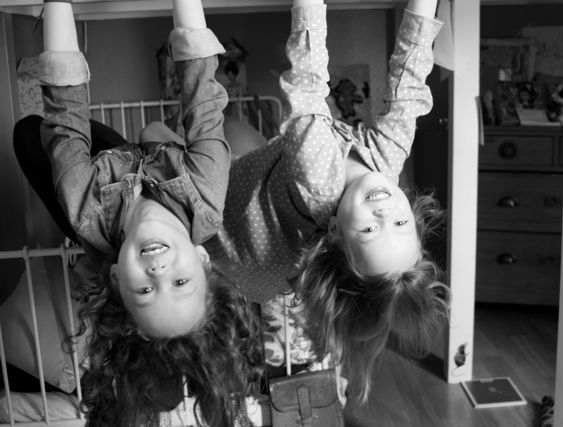 Now, not one single time in the 4 years that the girls’ room has been this way has anyone fallen off the top, though there have been a lot of jumping competitions with mattresses and pillows pilled up at the bottom. It is also a room that is not very designed or always super tidy. Again as we live in a relatively small space, I wanted the girls to feel like it is their little den. They were allowed to choose the colour of their “rooms” and also hang up what they want on the walls. There have also been numerous performances on the top level with the audience sitting down below. I am going to miss this little room and am still trying to figure out a good configuration for taller girls. (I actually would love it if they started growing a little bit more slowly ;)). PS. The top photo was taken by the lovely Emily Ulmer. The middle one is from my Instagram feed whilst the bottom one is of little Caspar playing in our flat last summer. Good question! I actually think one of the most long lasting presents my girls have ever receive is a doll from their grandmother. She also made them a whole wardrobe to go with it and they spent hours when they were smaller playing with the dolls and now try and sew clothes for them and build furniture out of fruit boxes etc. I think it is beautiful. 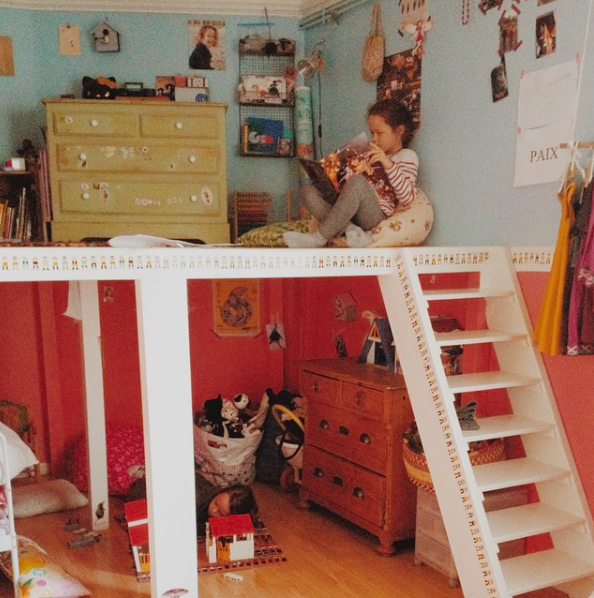 I would have loved to grow up in such a room! What a great idea. Very much a “place of one’s own”.